Unexplained harassing election phone calls continued to dominate Parliament Monday, with interim Liberal Leader Bob Rae saying his party will make public its telephone records while Conservative MP Dean Del Mastro refused to promise the same of his party. At the same time, Conservative MP Maurice Vellacott blamed Elections Canada for voters going to the wrong polling stations. Rae said the Liberal Party was working on releasing as many of its records as it can at the same time Conservative MP Dean Del Mastro refused to release the Conservative Party's records. After question period Rae said his party is amassing all the information it can and seeking approval from the companies it used during the last election. He said the Liberals will make as much of it public as they can. "We're hoping to release stuff as soon as possible," Rae said. He described Del Mastro's statements as "wacko" and said he is following Harper's orders to obscure the issue and intimidate others. Rae expressed frustration over the government's performance in question period, saying the daily event is "almost unrecognizable." "You can't get anything even close to an answer to anything you ask," he said, adding there is no engagement on behalf of the ministers who respond to the questions. "There's nothing." 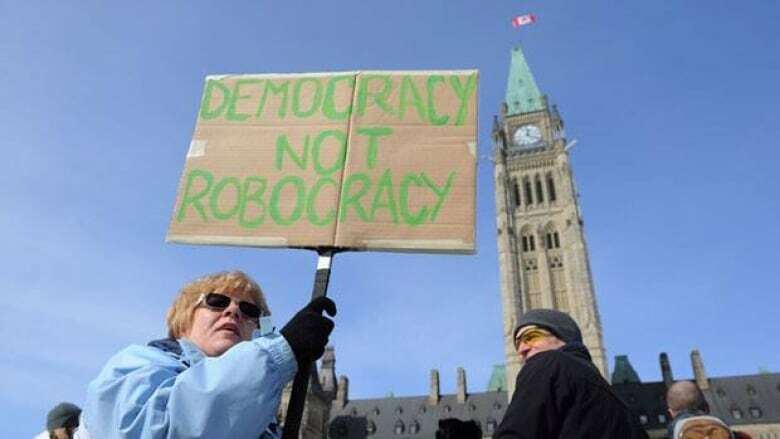 Elections Canada could itself be responsible for the robocall controversy, Saskatchewan MP Maurice Vellacott said. Vellacott, the Conservative MP for Saskatoon-Wanuskewin, released a statement on Monday that said "numerous address errors" were made by Elections Canada with its list of eligible voters in each of the six elections he's contested. "Because Elections Canada too frequently provides incorrect information, and secondly because technological problems occur with trying to merge Elections Canada info for phone lists, there is a significant potential for error," he said. "Hired live phoners or automated calling systems are only as good as the data provided to them. You know the saying, 'garbage in, garbage out.'" Elections Canada is investigating fraudulent calls made to voters in Guelph, Ont. in the 2011 election and has received more than 30,000 contacts from Canadians since that story broke. There have been numerous complaints about being misinformed about polling station locations and about receiving harassing and rude phone calls. The opposition parties have been blaming the Conservatives, who have denied any wrongdoing. "I suspect that at the end of the day, if Elections Canada has the resources to do a proper investigation, they'll find they're themselves significantly responsible — that tech issues with marrying EC lists to available, electronic phone lists is part of the problem, and in a few instances there may have been malfeasance by one party or the other," Vellacott said. The controversy continued to dominate Parliament Hill Monday. About 100 demonstrators braved -24 C weather to demand answers from Prime Minister Stephen Harper on what happened in the last campaign. The protesters also want a public inquiry into the phone call controversy. One of the organizers, Arun Smith, told CBC News a public inquiry could help restore voters' confidence in the electoral system. "It is very important that a public inquiry be called because of the tools and resources, the power of subpoena, that a public inquiry would have," he said. The Ottawa rally comes after a demonstration in Vancouver last weekend that attracted approximately 250 people. More protests are planned for next week in Toronto and Calgary. The opposition parties tried to hammer the government in question period over the issue, while Conservative MPs deployed the same lines of defence they used last week: The opposition parties are sore losers who refuse to accept the election results, leading them to make "unsubstantiated smears."